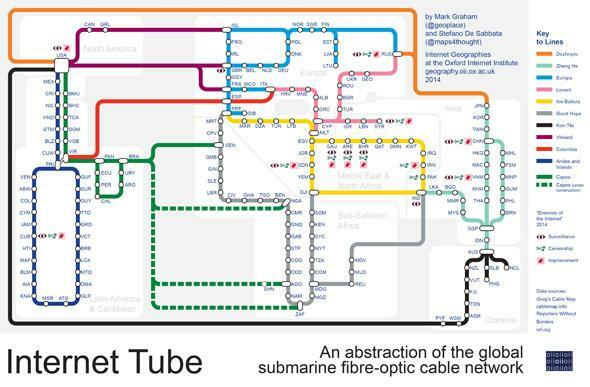 The Oxford Internet Institute's subway map of the Internet condenses node data and reliability. We usually think of the Internet as a web. Its interconnected mesh allows data and ideas to spread around the world. But Mark Graham and Stefano De Sabbata of the Oxford Internet Institute like to reimagine this metaphor through different visualizations. And this time they’ve created an Internet subway map. Each stop on the subway is a node (a place where data is sent and received like an Internet service provider) assigned to a country. Where there were multiple nodes in one country, Graham and De Sabbata combined them into one stop. The two took node data from cablemap.info. “The map … aims to provide a global overview of the network, and a general sense of how information traverses our planet,” they wrote. The map also uses symbols to signal that certain countries were listed on Reporters Without Borders’s list of Enemies of the Internet. How central a subway stop is on the map is based on factors like how much power a country uses to control or surveil Web traffic, and how frequent service disruptions are. The calculations behind the map also consider fiber-optic cables submerged in the oceans that connect continents. For example, Senegal is the third most central part of the global network because most southern Atlantic cables emerge in the country. The United States and United Kingdom are first and second respectively. The authors note that being more central to the international network translates to faster and cheaper Internet within a country, but they note that many of these countries also tend toward increased surveillance, as seen with the NSA in the U.S. and the GCHQ in the U.K.. They write, “From this perspective, we also see the potential dark side of network centrality.” The center of town may not have the safest subway stops in this map. See a high resolution version of the “Internet Tube” here.